But than I read the article and realize that once again, it isn’t about gardening, it’s about a factory. Of course, reporting on factories and what’s going on with them is important news these days, but so is news related to gardening! Plants are like factories, which I guess is why they call factories, plants. They both have inputs and outputs and processes in between. In the case of plants, the growing green kind, the inputs are of course water, light and carbon dioxide and the outputs are oxygen and sugars, or something like that, and the process is photosynthesis. It has been a very long time since I studied photosynthesis in any detail. Now every time I get out my old textbooks, I wonder how I ever knew that stuff. Then I see little hand written notes in the margins and some stuff underlined and it makes me think those are the sections I should study in case there is a quiz. But then I breathe deep the oxygen output of the plants around me and remember that I already took that class last century and passed it, so I don’t have any more tests about photosynthesis to study for. One wonders if it makes us better gardeners to know about photosynthesis. Perhaps not, but I think it makes us more appreciative gardeners to know that these complex processes are occurring all of the time in the plants around us. Another complex process going on in the plants around us now is of course the changing of leaf color from greens to countless shades of orange, red, yellow, rust and brown and everything in between. Somewhere I learned that the other colors were always there in the leaves, hiding behind the green color of cholorphyll. Then the shortening days of fall causes the plants to start to go dormant before winter and produce less chlorophyll, and so the other colors get their chance in the big show. And a big show it is. 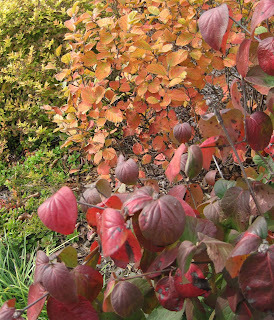 These two shrubs, Viburnum carlesii on the right and Fothergill gardenii next to it, are both trying to perform at the same time, in quite different, nearly clashing colors. It’s like one wants to play jazz and the other is trying to drown it out with rock ‘n’ roll. That’s fall, a lot of clashing, bright, garish leaves playing their own tunes, giving us one last show. I wouldn’t miss it for anything! We get very little autumn colour here, just the odd field of cherry trees, and I do miss it. Have found a solution though - am collecting leaves to press and going to make a collage! The plants around here are all going their own way. Some have given up already and others are brilliant with those wonderful fall colors. We have the best fall color we've had in years here in Wisconsin. Of course it's been blowing 40 mph for the last two days so I can't imagine there will be much of it left when the sun finally comes out! Just planted a fothergill this year (a baby) so I'm looking forward to seeing that color in future years! Very pretty! Those two shrubs don't look like they clash to me. At any rate, I'd rather have clashing colors than competing music bands! Before I get started: I'm a HUGE nerd. You can't say you weren't warned. But I think understanding photosynthesis DOES make us better gardeners -- I appreciate the beauty of an apparently simple leaf all the more when I think of the miraculous complexity of what is going on inside. And: There is another way plants are factories! They're chemical factories! Think of all the flavors and scents (not to mention medicines, insecticides, toxins and drugs) plants produce! Each tiny leaf is a factory of complexity and efficiency that puts our human created 'plants' to shame. The more we understand, the more we marvel. It's pretty noisy around here right now with all the loud colors of fall trying to outdo each other in volume. But enjoy it while it lasts--lots of leaves are falling as I write. Plants call the tune in any season. That is, for us gardeners and those who love plants and nature. Thanks for the biology lesson. It has been since 1986 when I had that class. Brought back memories! I'm happy to overlook color clashes in autumn because soon there won't be any color clashes, it'll all be black, white, brown & gray. I love those clashing, bright fall colors. Keep showing them for us fall-challenged gardeners.